A truckload of computers is prepared at Edwards Air Force Base, Calif., for delivery to a local school. The donation was possible because of an educational partnership agreement between the Air Force Test Center and the school district. 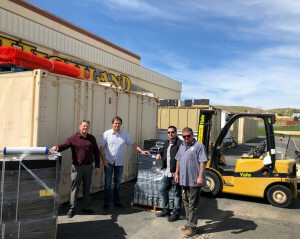 Several school districts near Edwards Air Force Base in California are benefitting from computer donations courtesy of the Air Force Test Center and the 412th Test Wing. Because of the nature of the work conducted at these locations, the 412th Test Wing is required to upgrade staff computers every 18-36 months, leaving a surplus of computers that still have plenty of service time left. Typically, the surplus computers were going to Defense Logistics Agency Disposition Services to be sold for pennies on the dollar. Doug Hoffelt, the AFTC technology transfer and research manager, saw an opportunity to use the surplus to make a difference with local schools. “By establishing educational partnership agreements with six different districts, we have been able to transfer the computers that are still relatively new to schools in our local area,” Hoffelt said. An educational partnership agreement, also known as an EPA, is one type of technology transfer agreement between a government agency and an educational institute for the purpose of encouraging and enhancing learning experiences at all levels of education. The agreements can provide a quick vehicle for transferring equipment the government can no longer use. With the agreements in place, Hoffelt began transferring computers in lots of 300 to local schools in March. To date the AFTC and the 412th Test Wing have donated nearly 1300 computers to local schools. Doug Hoffelt, (far right) the technology transfer manager for the Air Force Test Wing stands with employees of Highland High School during a computer equipment donation. The donation was possible because of an educational partnership agreement between AFTC and the school district. One donation is allowing one districts to provide learning experiences that it previously could not offer. The program will continue to grow as more EPAs are established with other local districts. For more information on educational partnership agreements with the Air Force, please contact the Air Force Technology Transfer Program office at 937-904-9830 or af.techtransfer@us.af.mil.